No precise site koordinates are given in the text below. For info about such contact me using the "Kontakt" form. 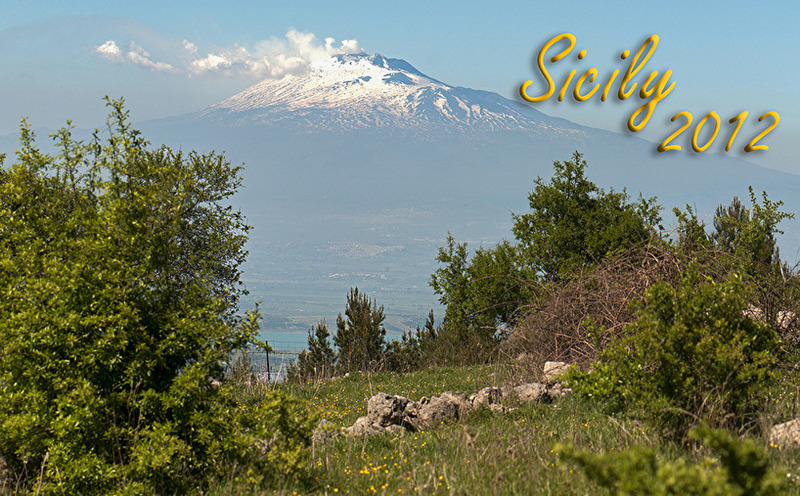 This year the goal for our orchid journey was Sicily. 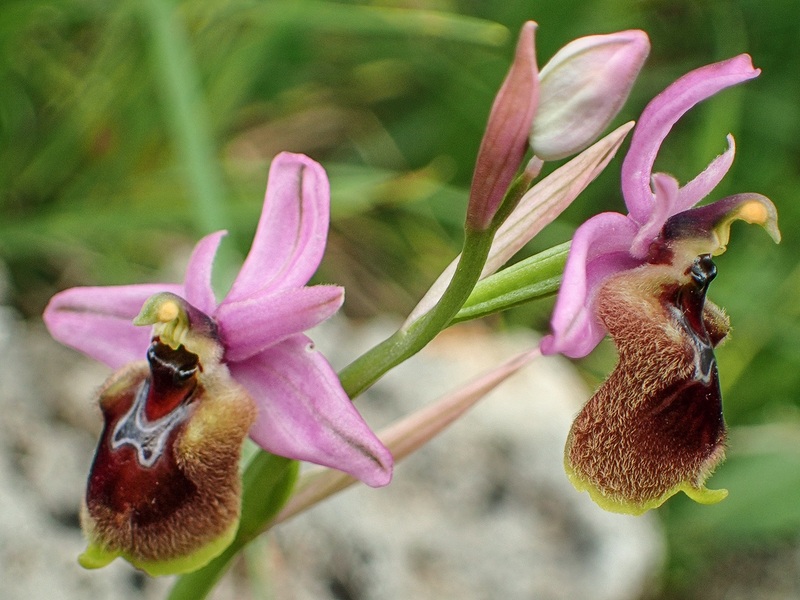 This time it was the orchid flora in the Southeastern part of the island we would studie. It ended up with 19 people who lined up at Rome airport after flights partly from Arlanda, partly from Kastrup. 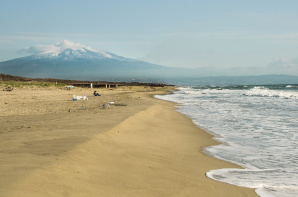 From Rome, we then flew with Alitalia to Catania where we picked up our five cars that would be used during the week. 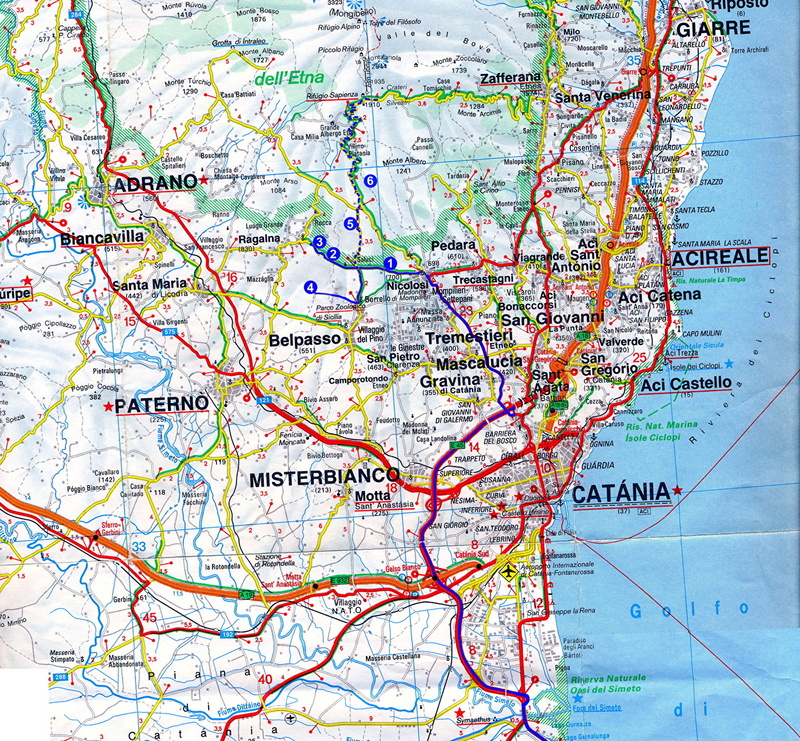 We had this time chosen accommodation in Catania which could be a good place to start from for the areas that were planned to visit. 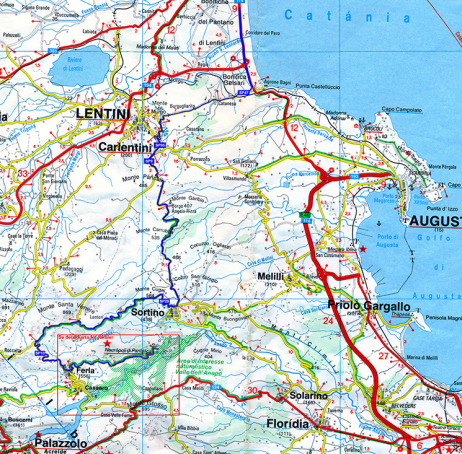 The short drive to our apartment hotel, in Catania's southerly suburbs, turned out to be real tricky. Barely halfway there was a halt on the highway because something, probably a truck had caught fire and was burning with huge smoke on the other side of a tunnel that we had to go through. Finally the police turned the traffic direction and we had to drive back to an earlier exit. But with GPS assistance we finally reached to the hotel after about 3-4 hours of delay. The apartments were found to be of a good standard and newly renovated. We were the first guests of the year. A credit has to be given to the staff, they were very nice and helpful. We were e.g. 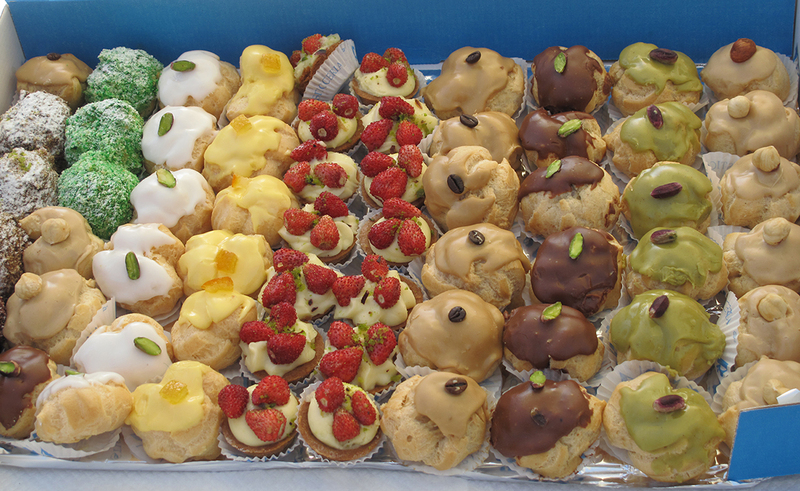 an after-noon invited to a "Sicilian Sweets" party where they had put up with the typical Sicilian cakes, pastries and other treats, coffee and a glass of champagne. Very much appreciated! The week started well with sunshine and nice weather. It turned out that we had this nice weather rest of the week too. We had, in other words a week with really nice Swedish summer weather, with about 20-25 degrees. Excellent excursion weather! The only thing you could complain about was the signs through all these small towns that you had to drive through. Trying to follow the GPS, frequently led to that you ended up in the middle of the crowded cities with big problems to find the right way out again. From vegetation we could see that the spring wasn't early this year, maybe slightly late. 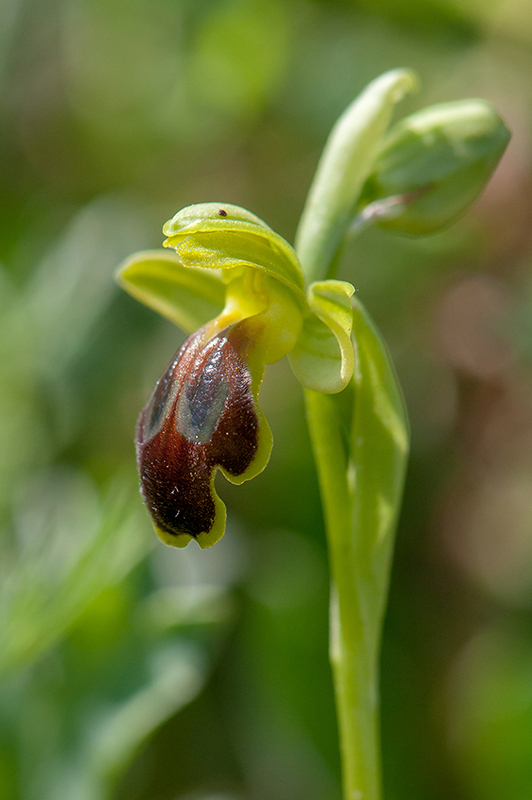 But the heat, which arrived just in time before we arrived, had speeded up at least the orchids so we did find most of what we had expected. Some species, however, we completely missed, e.g. 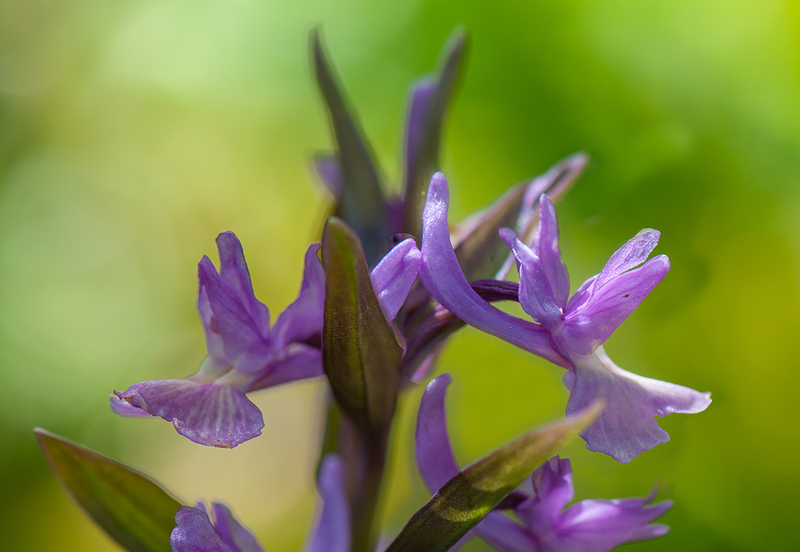 Anacamptis pyramidalis, a species that probably would have needed a warmer spring to be in bloom at this time. 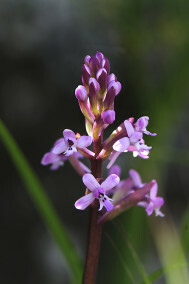 This was the same for Anacamptis coriophora subsp. fragrans that we didn’t see. 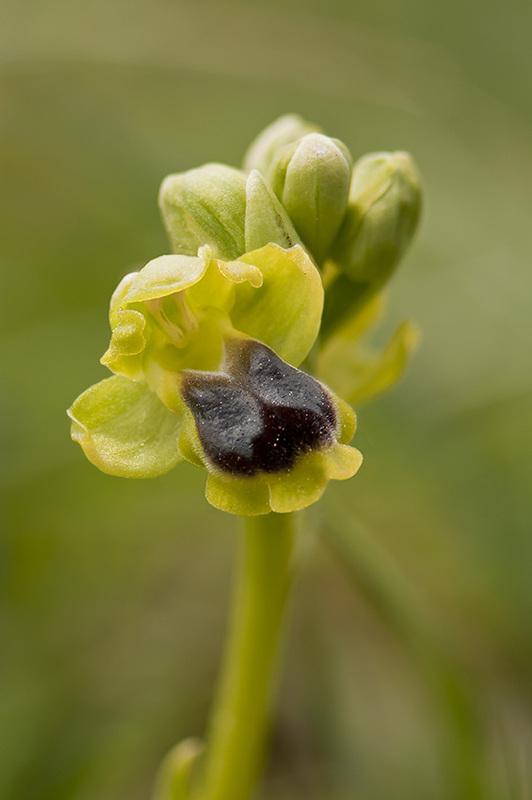 That Limodorum abortivum, wouldn’t be flowering was perhaps more expected. Those plants we saw were not higher than 5-6 cm. 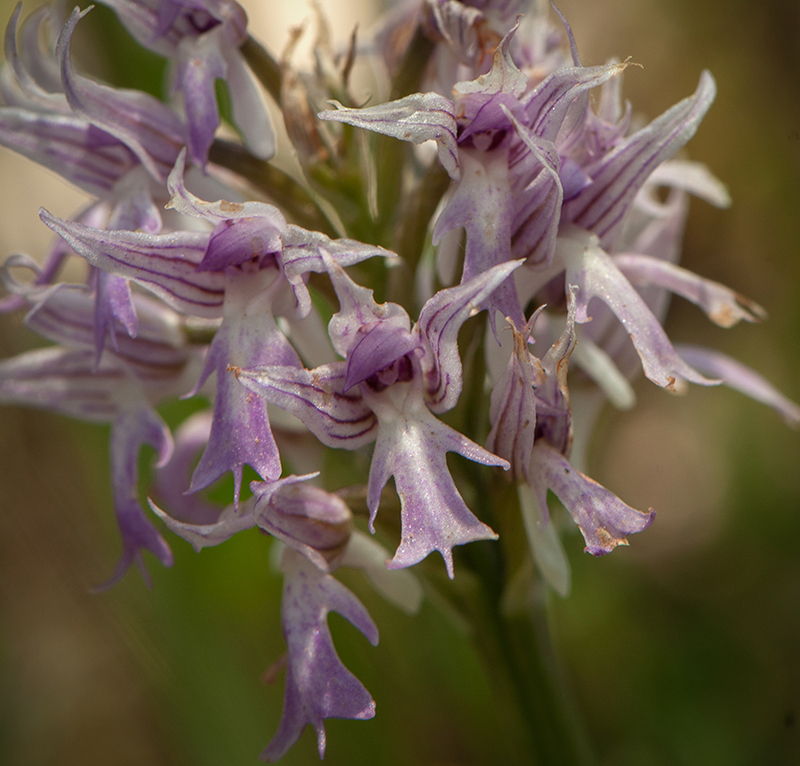 Another species that might have been hit of a chilly spring was Orchis anthropophora, an otherwise common species that we only saw once the last day. 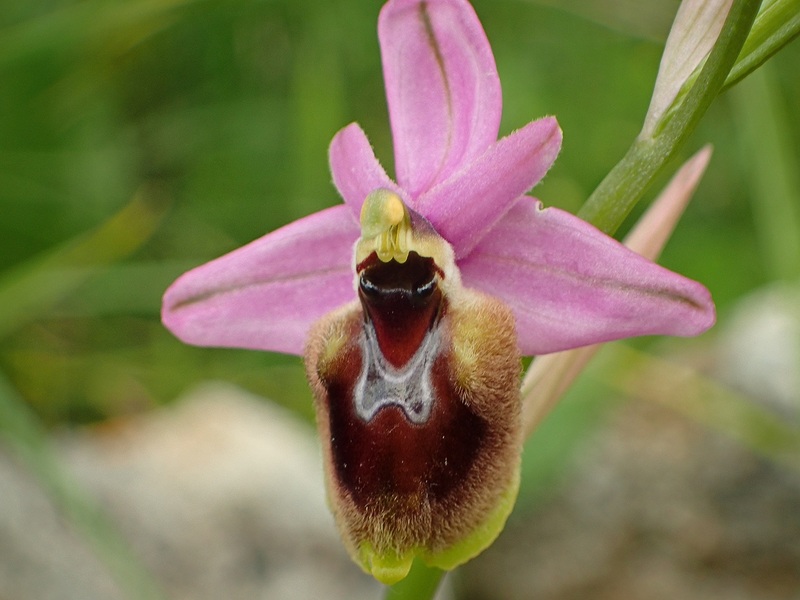 Sicily has a lot of orchids in O. fusca / subfusca group and as usual those were difficult to set correct name at. Only looking at these species with years apart, it is almost impossible to distinguish the species. Some uncertainty exists in some of the species identification made in the writing below. More enjoyable is it to find those species that are easy to identify. 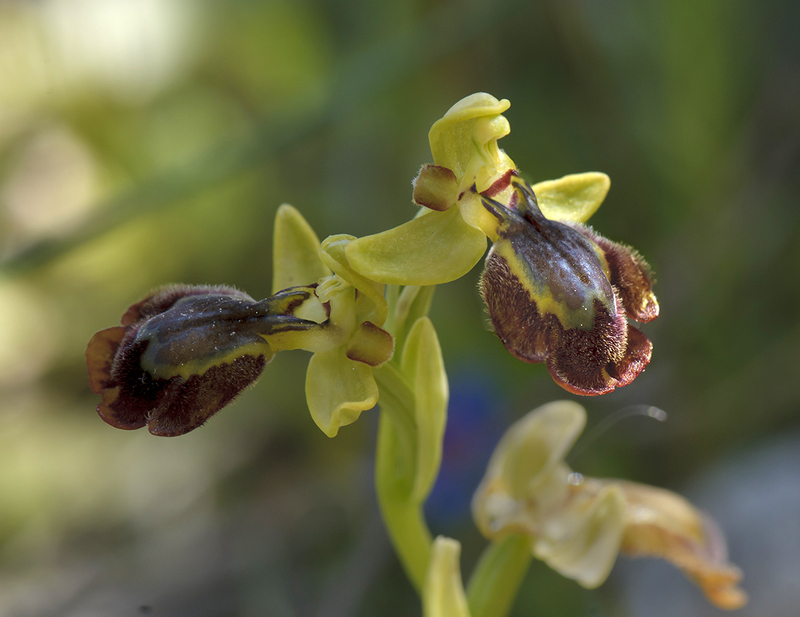 Two species, both of which have a very limited distribution in Sicily, are Ophrys laurensis and Ophrys mirabilis. These we managed to find both and as said here there was no difficulty with those identifications. Another note we did was for Ophrys tenthredinifera or O. grandiflora as we might call it now. What I remember from our last visit in these parts of Sicily (2003) this was one of the more common that we saw. Now, we did not find many and very few if any of that really big, colorful variety. 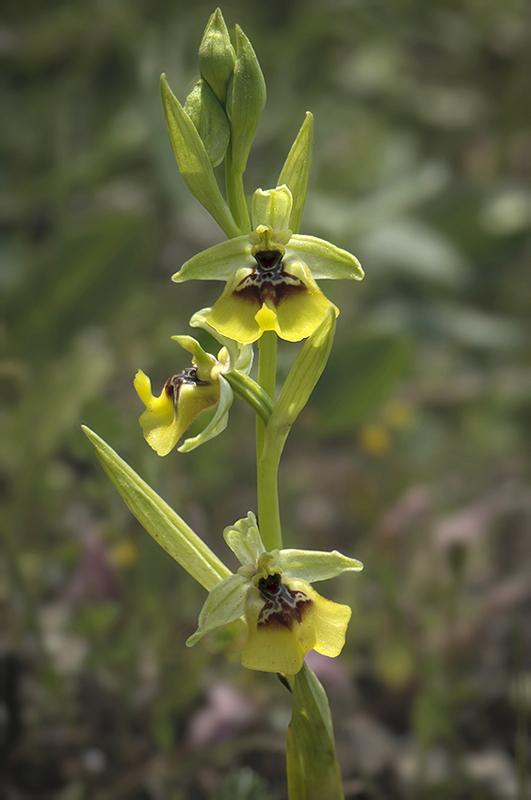 In contrast, what we failed to do last time, was finding Ophrys lacaitae, the much sought after, large-flowered, yellow Ophrys. This year we had it on at least four different sites. 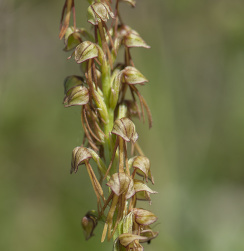 In addition, we also found what looked to be hybrids with O. calliantha respective O. oxyrrhynchos. 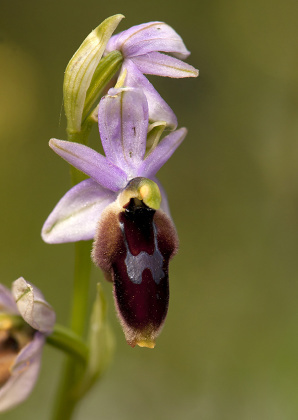 In total we saw about 50 species during the week, a result that was above our expectations. The following pages is a report from our daily excursions with a short presentation of the visited sites and what we found. The route numbers, reffered to below, are the number of the (during the winter) six preplanned routes. 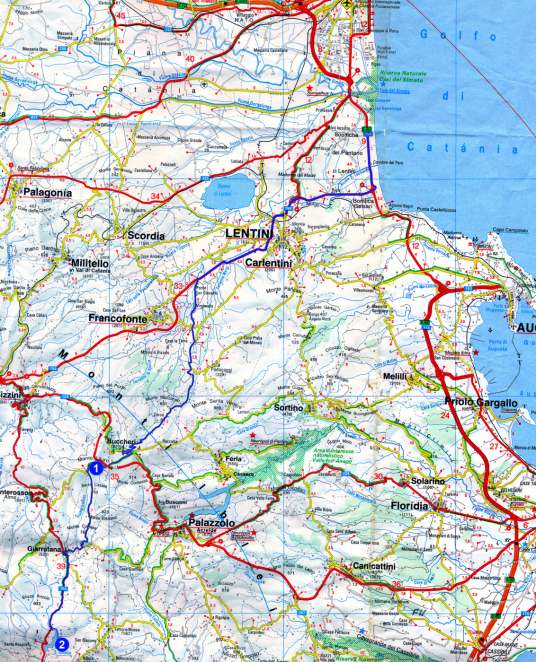 For our first day, we chose Route 1: Etna, Nikolosi - Ragalna. This was one of the shortest of our pre-planned excursions, and since the morning this first day was for shopping in the local grocery store a rather short route was preferable. The day started well with bright sunshine. The route site 1 turned out to be no big shot, a really dump! So we proceeded to next site, site 2. Site 2. Here at the 5 km sign, we parked and then climbed around in the lava mounds to the right of the road. 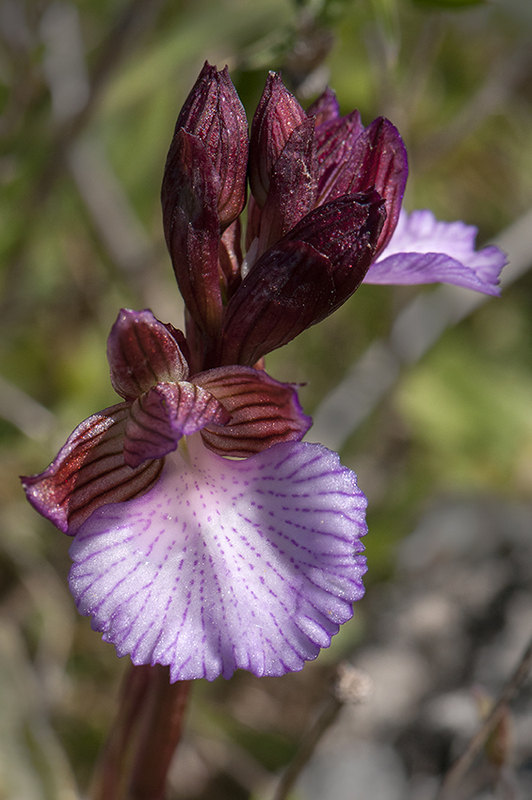 Difficult terrain to get around in, but well worth the effort as we here found, among others, the Sicily endemic (and Sardinia) Orchis branchifortii. Site 3.The site was about 1 km further along the road, also a lava area to the right. Here we found more O. branchifortii but also another Sicily endemic, Serapias orientalis subsp. 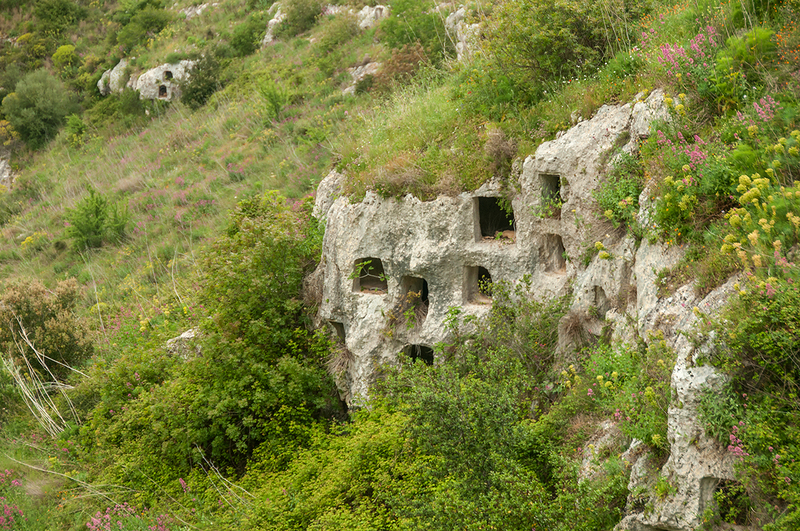 siciliensis. Site 5. After site 3, we turned back to the roadcross where the road to site 4 left to the right. But since we decided to drive up to Mount Etna, we chose to skip site 4 and proceed left to site 5, which was about 3.5 km from the roadcross. 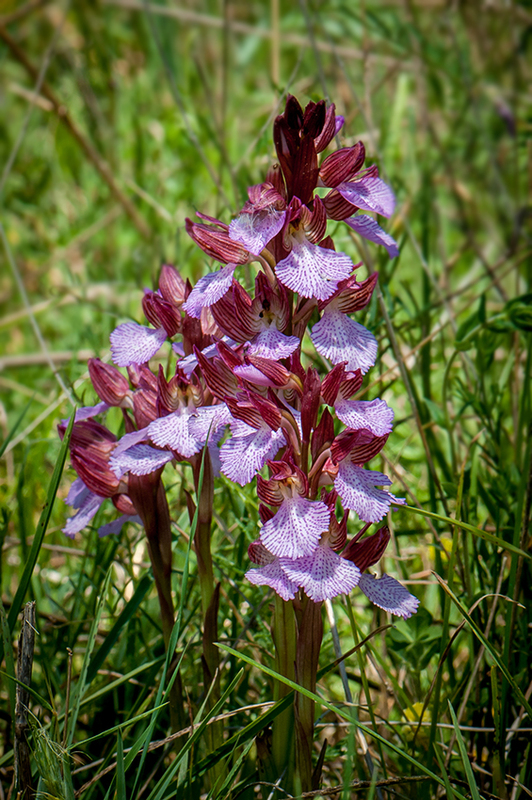 The area consisted of meadow-like pastures and here we had a lot of interesting species, although we failed to find Dactylorhiza romana subsp. markusii. Some Dactylorhiza plants caused however discussion when they showed signs of both markusii (romana) and sambucina, possible hybrid perhaps? Site 6 did not look interesting, dense forest and no possibility for parking. Therefore next stop was Mount Etna after an interesting journey through the lava that a few years ago poured down through the slopes. Here, at almost 2000 m, there was still snow. 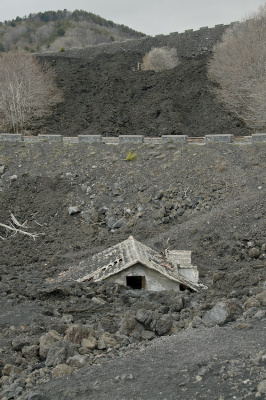 Heavy clouds had now subsided around Etna's peak and the temperature was not more than about 5 degrees. After visiting the souvenir shops and other shops in the tourist center up here, we drove back home same way as we come. Once back at the hotel the sun shone again and promised well for the next day. For this second excursion Route 2: Ferla - Necropoli di Pantalica was the one we would follow. 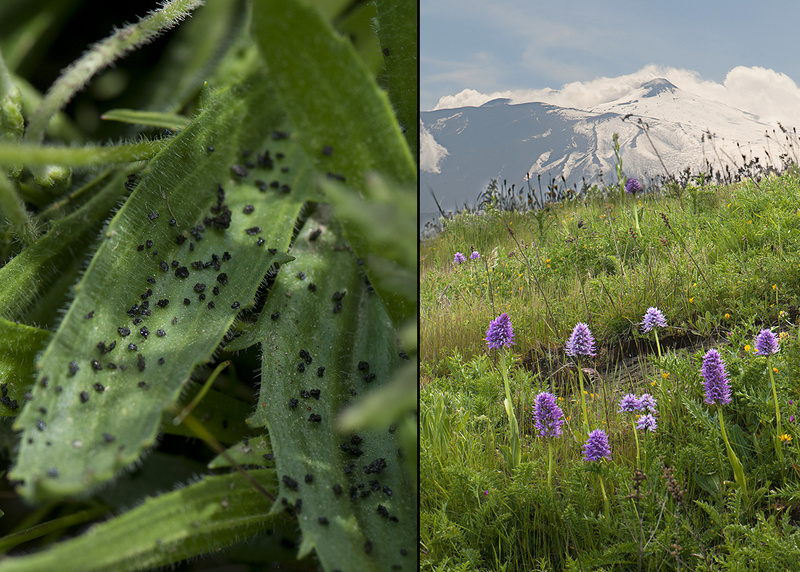 If not Sunday's route had given us so many species, we would today see so much more. In principle, most of the area along the road from Ferla to road's end is very interesting from a botanical point of view. Site 1 was the area opposite the "Visitors Center" about 4 km from Ferla. 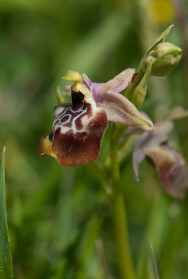 The slopes to the left of the road were very rich in orchids, especially Ophrys species. Most of the day was spent exploring the area from the "Visitors Center" and 5-600 m ahead. Site 5. Therefore, there was only time for one more stop. This was done at the route's site 5. Here, on the right side of the road (behind a fence), was a narrow open area with grass and behind this, sparse forest. Once again, it proved to be orchid-rich, especially the grassy part between the road and the forest edge but also inside the forest were orchids, such as Anacamptis longicornu. 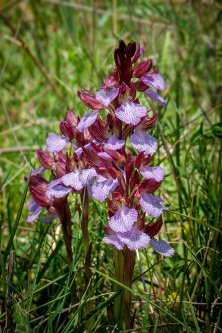 Also roadsides outside the fence had many orchids. After this site the day was almost over. Before we went back home we made a quick stop further along the road (which is a dead end) to take a closer look at some of the graves that once were carved out of the rock of the original population. Tuesday come also with excellent weather for excursions. Already at 9 o'clock it showed +19 degrees. Not surprisingly, it was now Route 3: Buccheri - Lago Santa Rosalia we would follow. Just like Monday excursion we would now go into the heart of the Iblei area. 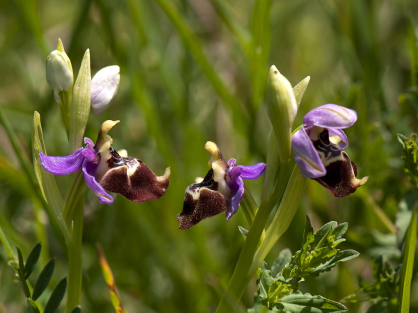 The goal was to find two of Sicily's most rare orchids, Ophrys laurensis on plateau Monte Lauro and Ophrys mirabilis at Lago Santa Rosalia. 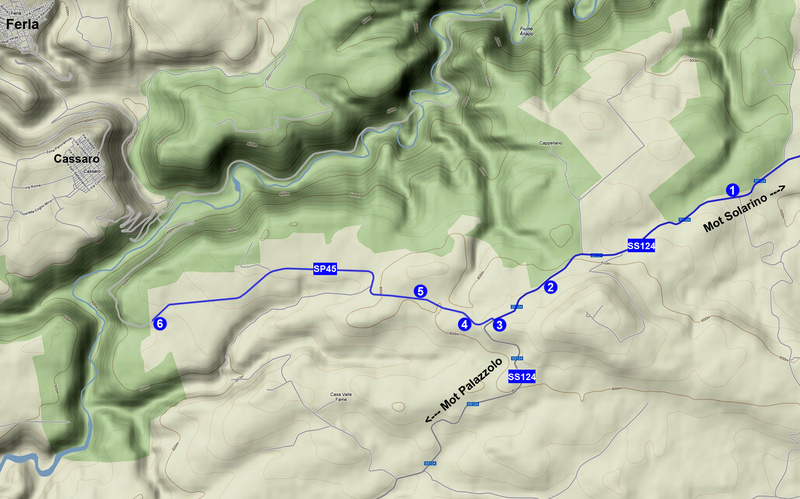 Site 1: We therefore headed towards Buccheri and later road SP 6 towards Gitarrana. After a few km we drove over an open area at ​​about 800 m level (next to some large telecom masts). Here we had site 1. 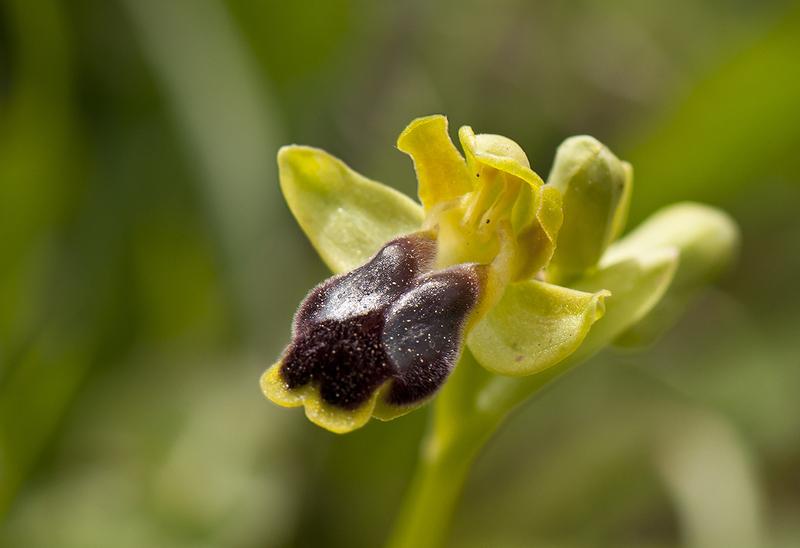 This is one of very few sites for Ophrys laurensis. Because it is a rather late species, it was now at the beginning of its flowering period. Besides O. laurensis there were a lot of other species. We found among other things, the only Orchis provincialis as we saw during our visit. Some O. fusca-types were for us, as usual, difficult to identify correct. After a few hours we left the area, although there were a lot of areas that could be of interest, e.g. a corresponding and equally large area on the left side of the road. Site 2: We continued on to Girratana and from there the road SS194 south to Lake Santa Rosalia. Here, before we arrived at site 2, we decided to take our lunch on the trip perhaps most idyllic resting place. In the sun, in the grassy slope, with the lake's waves lapping the shore, tasted our packed lunch, extra good. 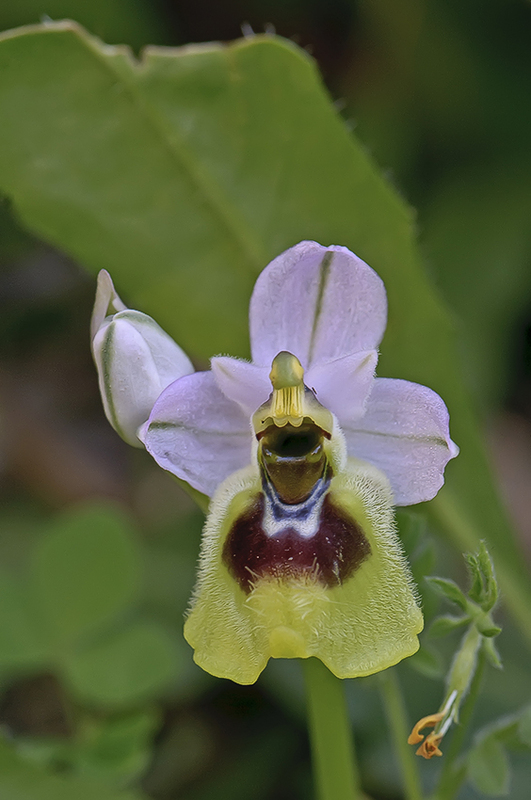 On the east side of the lake there was a site for Ophrys mirabilis. This is a small plant and it turned out not to be easy to find. But with the help of Remy Souche (a Frenchman who has written several books about Southwestern Mediterranean orchids) who happened to be at the site at this time, we got to see some plants anyway. Also O. mirabilis is a fairly late flowering orchid, there were not many plants at this time, and therefor difficult to find. 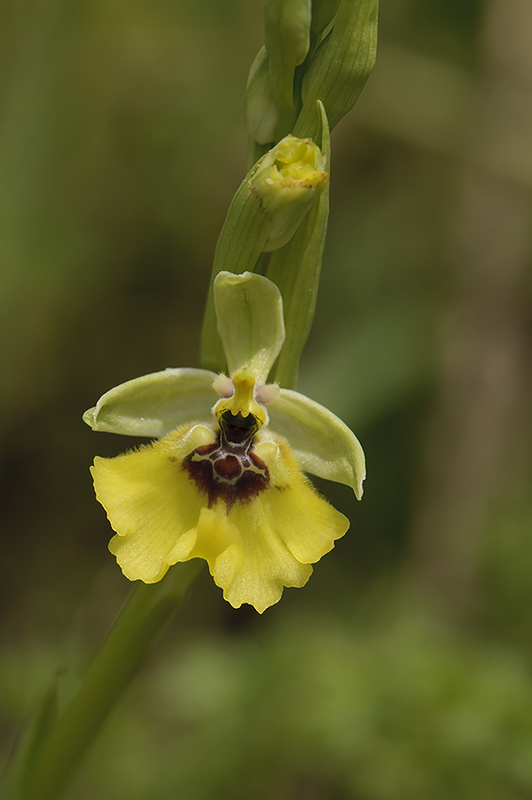 Here, too, there were a lot of other species of interest, such as several Ophrys fusca species. 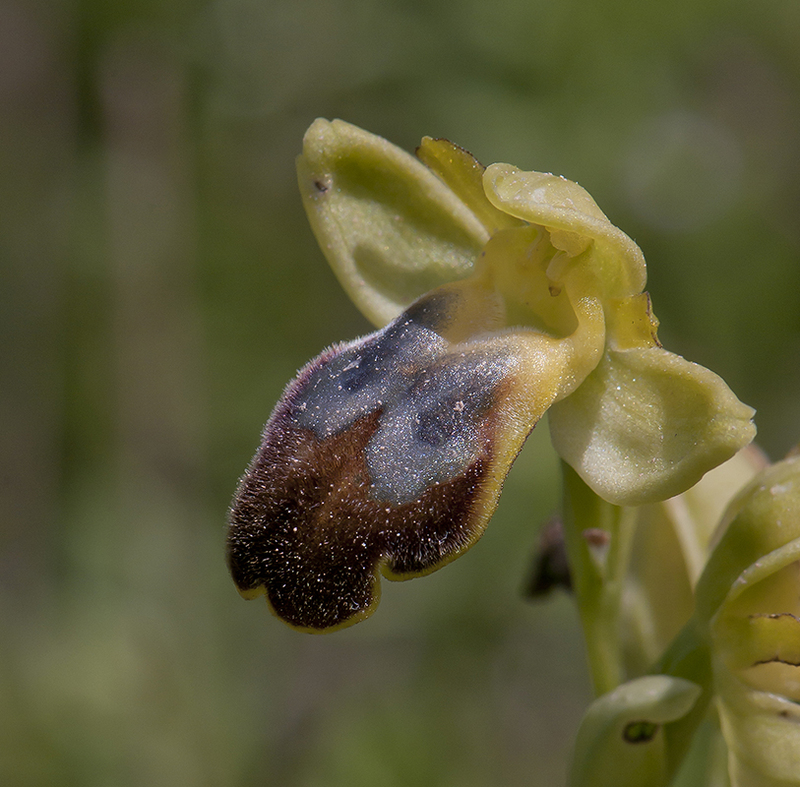 One of the most common at this site was Ophrys calocaerina or if it was, as some think that the one at Sicily is, the same as Ophrys fusca subsp. sabulosa. 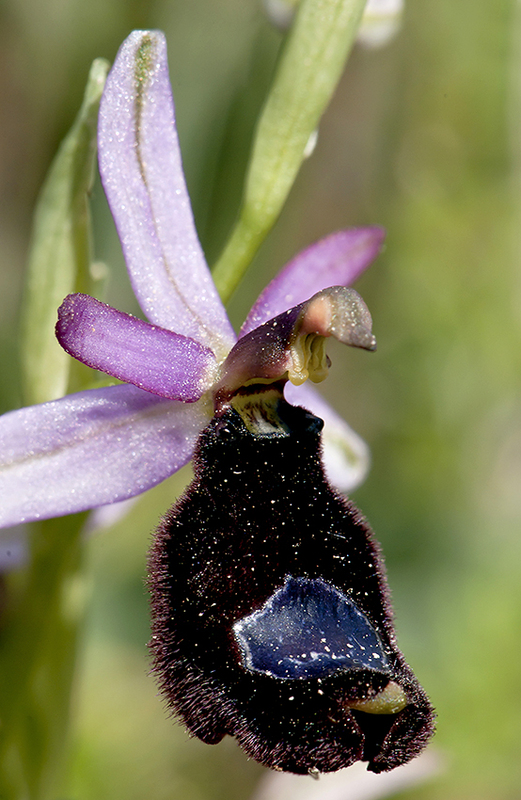 Ophrys fusca ssp. funerea ? 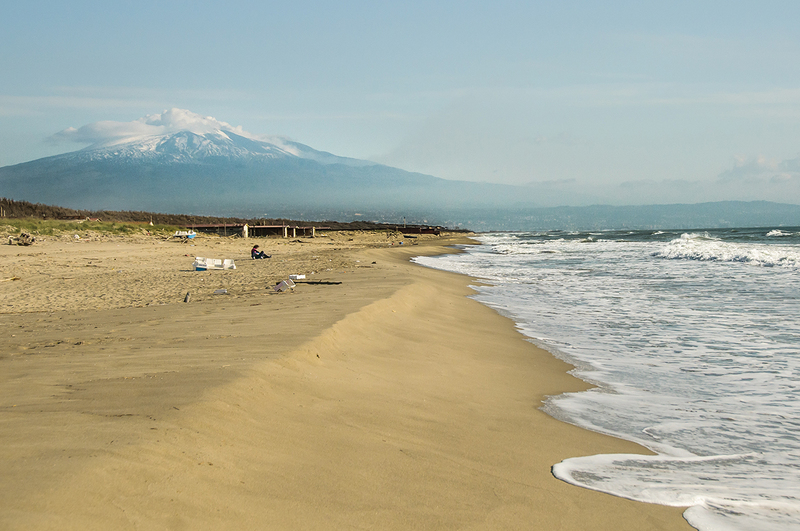 At day four of our week, we broke the pattern and chose Route 5: Etna north. 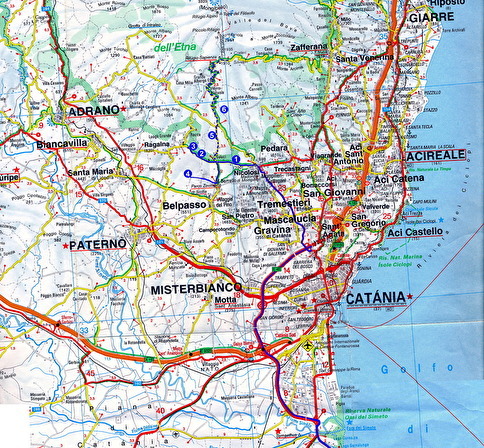 This was a route that would take us north of Etna via Linguaglossa and further to the northwest. Since we could follow the highway until the exit to Linguaglossa it went pretty fast even though there was many miles to drive. We continued past Linguaglossa towards Randazzo. Site 1. This was opposite the old disused railway station just before the intersection towards Castiglione / Francavilla. Here we could park at a plane to the right of the road. From there a trail continues and past the lava field, which extends along the main road, and up to the hillock which was the goal. Very nice area for the most part consisting of sparse wood and much herbs in the bottom layer and lot of orchids. 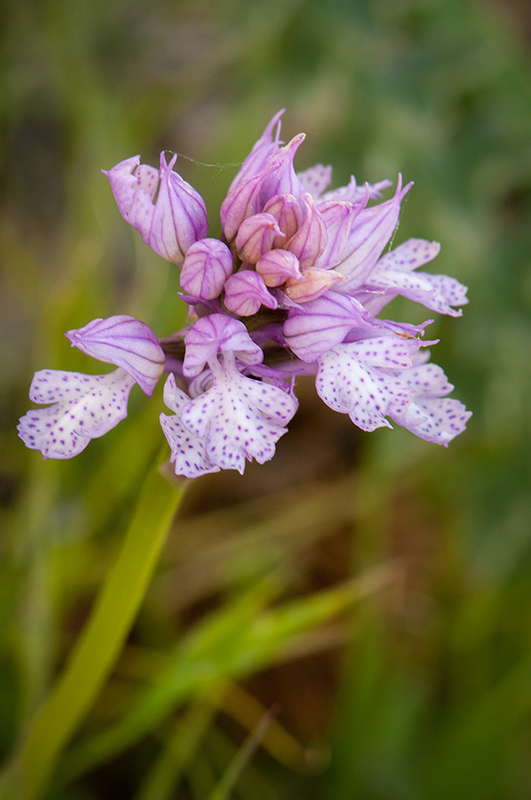 This was the only site where we saw Dactylorhiza romana subsp. markusii. Site 2. Back at the cars we continued a few hundred meters further along the road and then turned right toward Castiglione. Site 2 was some slopes to the left, about 2 km from the intersection. The area consisted of embankments, partly quite steep, with pastures. Interesting area with a lot of Ophrys. We had previously heard that Etna had "spit" out a lot of ash for a couple of days ago that had fallen down on Etna's north side. Now we could see it ourselves. Everywhere there were ashes in form of gravel-like fragments on the vegetation. 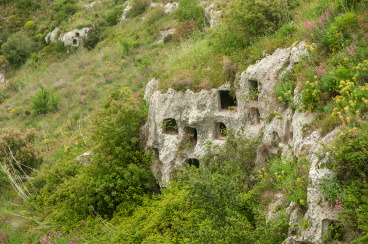 Site 4. We than decided to skip site 3 and continue on to site 4. This was below the small community Rocchella Valdemone. Once there, you should be sure to take the first road to the left to avoid the narrow streets in the village center, which we did. In itself a pleasant sightseeing but unnecessary. A winding road took us down to the valley below the village. From there we drove over a bridge and about 1.3 km after the bridge was on the right side open slopes with grass and scrubland pasture. 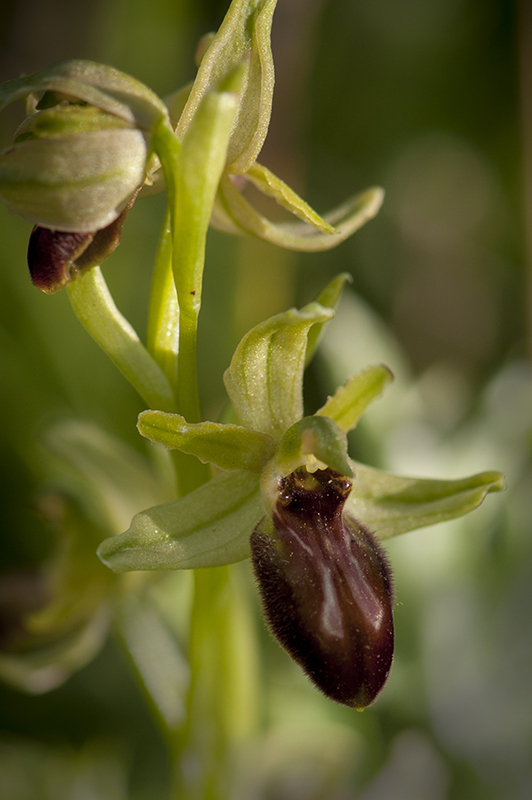 This proved to be an interesting area, including multiple occurrences of Ophrys lacaitae. The way back home, we decided to drive toward Randazzo and con-tinue on the western side of Etna. Doing so, we came to drive around the entire volcano during the day. An interesting experience was to see how its silhouette changed as we rounded it. The north side had far more snow left we could see. 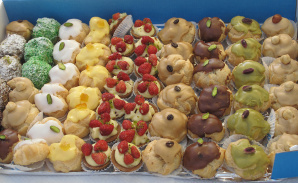 Thursday's excursion should be shorter than usual so that we would be home in time for the hotel's "Sicilian Sweets" party. 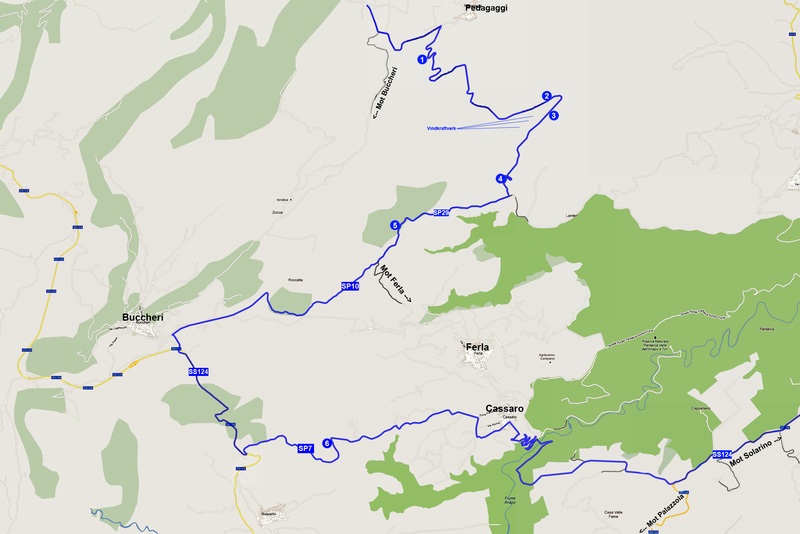 We therefore chose parts of Route 6 as the target for the day. 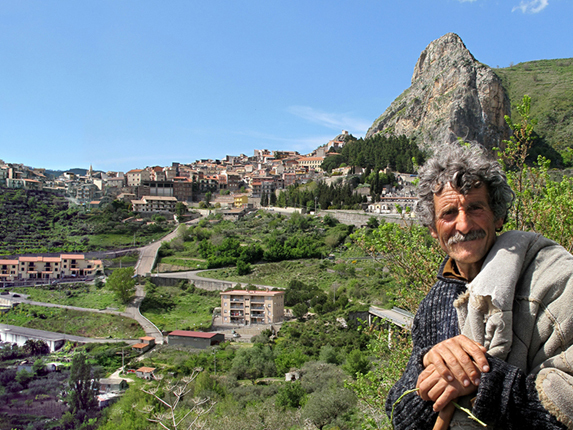 The tour went again into the heart of Monte Iblei, to the road section Solarino - Palazzolo, road SS124. Site 1: This site was at Km sign 94. Here, at a T-junction, we explored the area to the right of the road with rocky, bushy pasture. Interesting area with an unusual amount of Serapias who otherwise seemed not to be in full bloom yet. Site 2: After a much needed lunch we continued up to the site 2, which was about 2.3 km further on. This turned out to be one of the most diverse on the whole trip. The site consisted of a hill just beyond a narrow cultivated fields stretching along the road. 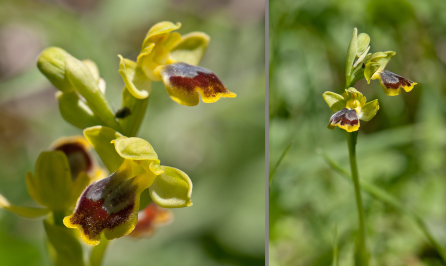 Here was a good opportunity to study the differences between Ophrys bertolonii subsp. bertolonii and subsp. explanata since both species grow here. Below som species from site 2. Because we had an hour's drive home, we decided to cancel rest of the day's excursion after site 2 and went home to taste the goodies that the hotel staff put out. Even this last day at our week we choose to go into the Iblei area. The last one of our preplanned routes was no 4 nut we chose to start with a few sites from Route 6, Thursday's trip, and then finish with parts of Route 4 but in reverse order. Route 6: Site 3 (for map see above). Today's first stop was at site 3 Route 6. The site was at left side of the road (SS124) just as we arrived to the junction with the SP45. 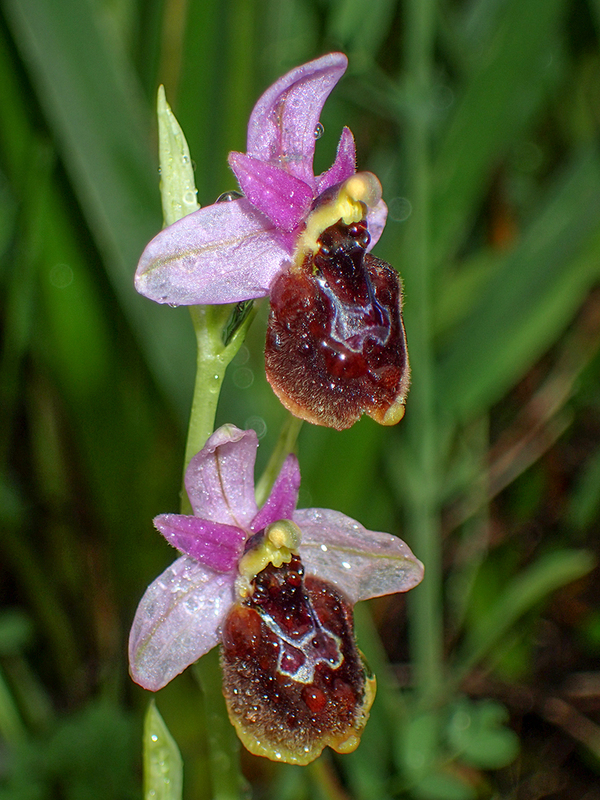 Here in the slopes a little bit from the road were many orchids, very rich in species. A fence along the road created some problems until two young men, who apparently was the owners of the land, appeared and offered to open a gate through the fence, after that they got to know was we were looking for. 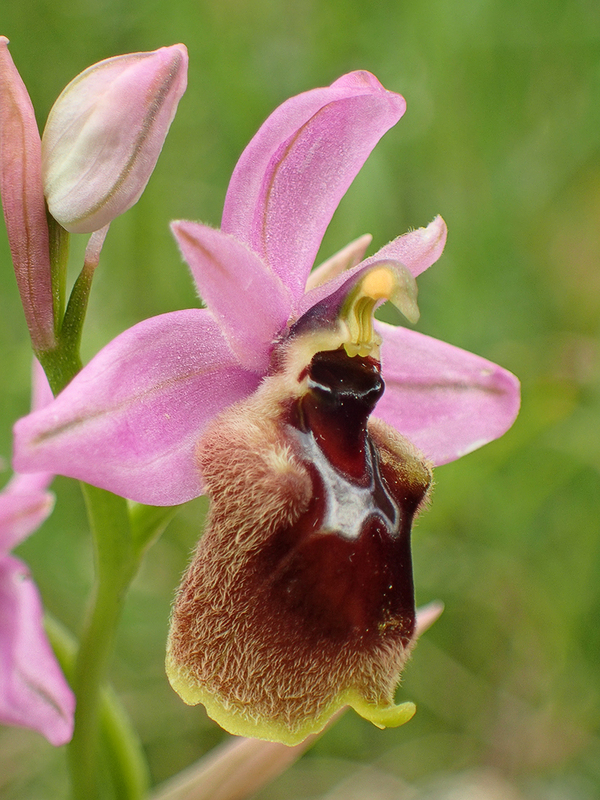 A strange orchid from this area was a hybrid between O. speculum and an unknown O. fusca sp. 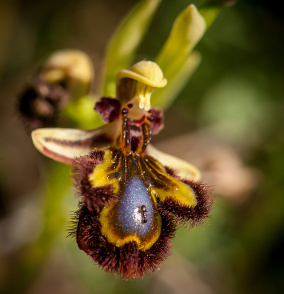 Ophrys fusca ssp.calocaerina Ophrys speculum x Ophrys fusca sp. Route 6: Site 4: After this first stop we turned right into SP45 but didn’t drive more that about 300 m for a second stop. We parked at a gas station at the right side and crossed the road. The site consisted of abandoned pastures and even that there was not that many orchids the number of species was quit high. Route 6: Site 5: Next stop was about 550 m further on. The site was to the right of the road, opposite a fruit farm and consisted of rocky grassland with some shrubs. Few orchids. Route 4: Site 5: From last stop we didin't followed the blue marked road to site 6 at Route 4. 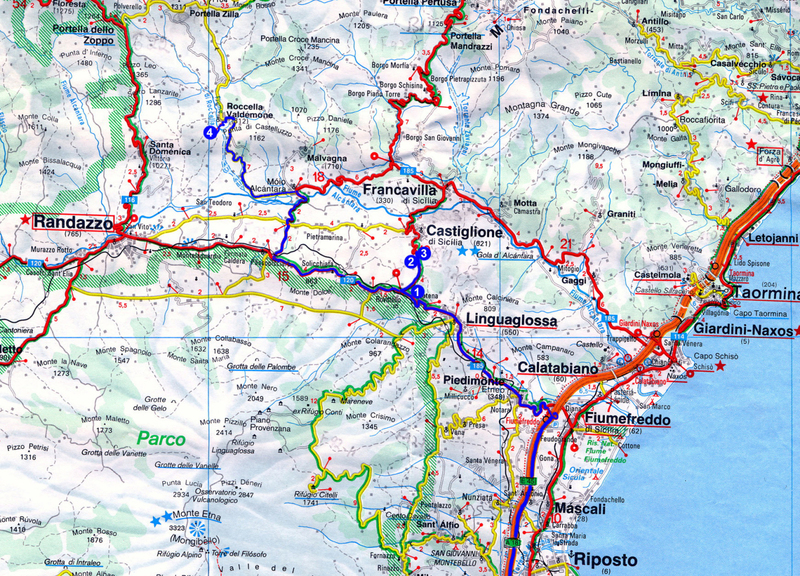 We drove stright from Cassaro to Ferla and further toward road SP29. Stop 4 was done after that we passed Cassaro and Ferla and entered the stretch of Route 4 and turned into SP29. About 5 km from Ferla, opposite some sort of building behind a steel gate to the left, there was to the right an area of ​​hilly and rocky pasture. Interesting area who might have been better explored. 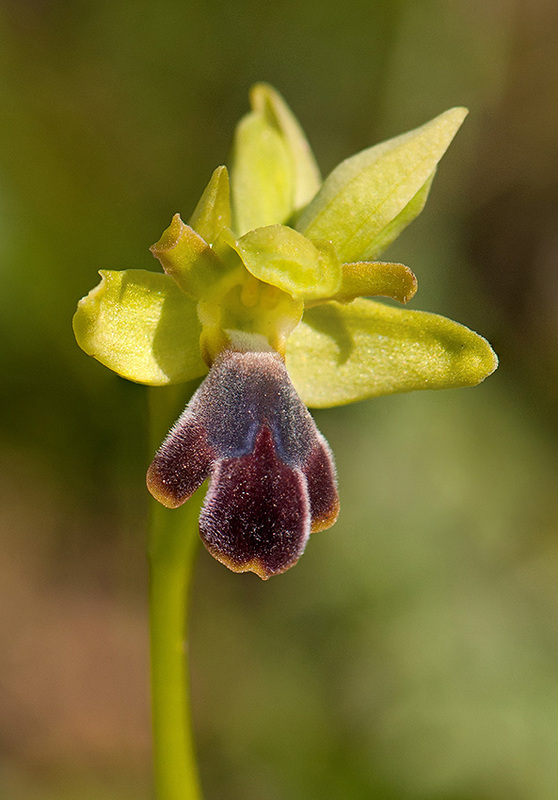 This was the only site where we found Ophrys fusca ssp. archimedea. Route 4: Site 4: Stop 5. A quick stop in a forest mext to the road was done. We searched the area to the left of the road in a sharp right hand curve. Sparse oak forest with grass bottom. 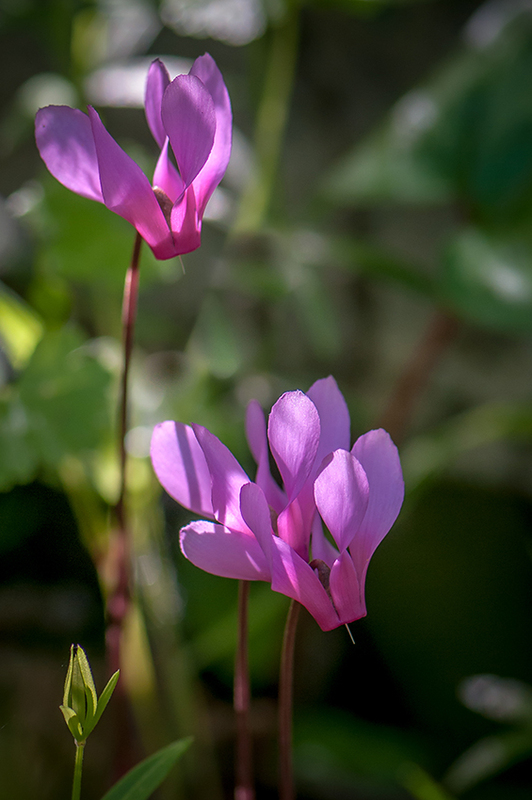 Few orchids but a beautiful area and lot of cyclamen. Route 4: Site 2: Our journeys last stop was beneath some wind turbines. Very interesting and species rich area, one of the most diverse sites on the trip. Steep slope to the left. We parked at an old quarry next to the road. After this last stop, a quick summary of the week could be made which showed that we had not only been lucky with the weather but also with the orchids. 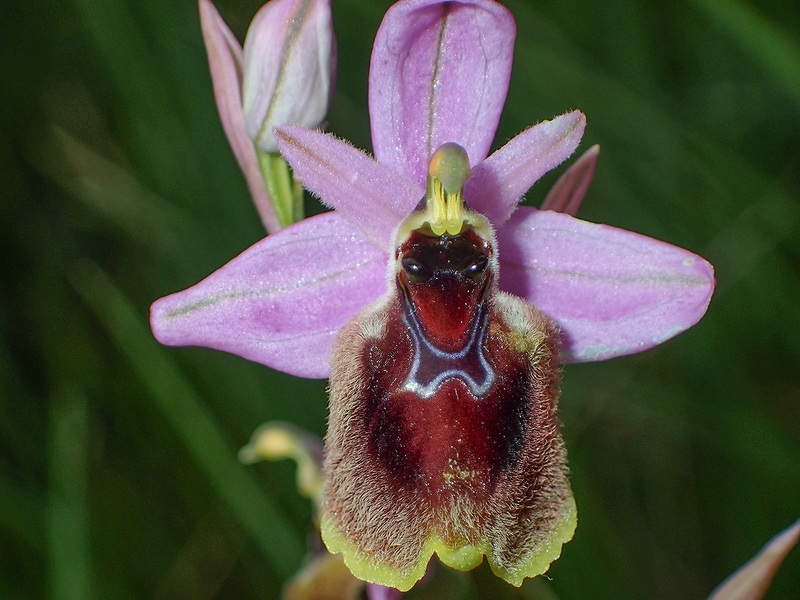 A total of 51 species / subspecies were found during the week and some hybrids and color variants. 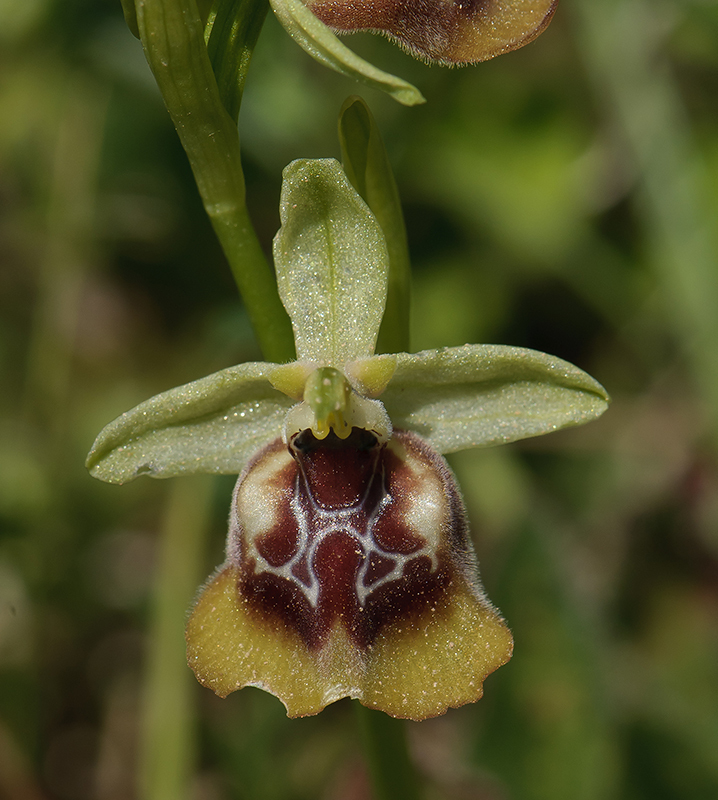 Even the fact that we was able to find such an amount of species, there was still one that I had hoped for, the hybrid Ophrys lunulata x tehthredinifera. 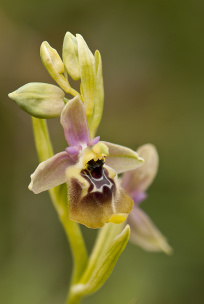 This has got the name Ophrys x lidbergii Mazzola, named after a Swedish botanist, writer and artist, Rolf Lidberg. He was living at Sicily for some periods and his friend Professor Mazzola named this hybrid after him. Since Ophrys lunulata only can be found at Sicily you have to go there to find this. Unfortunately we didn't find this, even that we found both parent species quite frequent. I have later on got pictures of this hybrid from a friend, Mihai Bobocea. Below you can se some of his pictures.